"If they're good enough for Deer, they're good enough for your MOTHER, Stanley." These are very salty, like your favorite kind of Sailors. In a mixing bowl, mix softened butter with flour, salt and granulated sugar until a crumbly dough forms -- flour should be completely mixed in. Press into prepared pan, building up a bit of a wall on each side. Prick three or four times with the tines of a fork, or your fingernails, and bake for 15-20 minutes until golden and set. Remove and cool completely. Over medium heat, medium low if you're really nervous, mix together the sweetened condensed milk, butter, salt and brown sugar until caramel forms. Stir the entire time, and don't walk away from the pot -- it might seem like it's never going to happen, but what you want is a thick, slurpy caramel that looks like caramel. It should not be pasty, it should not be thin, it should be golden and as thick as what you'd expected melted caramel to look like. And I'm for real, here. Stir the entire time, to avoid burning. It may feel like the mixture is sticking to the pan, but as long as no black or dark brown bits come up, you're fine, that's why you're stirring constantly. If the baby has the knives, then take the pot off of the heat and go take the knives away. Those are only for Grandpa Merv. Once you've reached caramelville, remove from heat, count to ten, add the vanilla extract stirring well (stand back, it might sputter) and pour the finished product over the shortbread crust. It will cool quickly, be fast and confident in spreading. The nice thing is that it will, or should, be thick enough to spread all the way to the edges without pooling over into the space left when the crust pulled away from the sides. Allow to cool and set, about ten minutes. Meanwhile, pour the chocolate into a heatproof bowl. If futuristic, use the microwave to melt your chocolate on half-power (or defrost), stirring every 40 seconds or so. If Old School, use the double boiler method and melt, in a bowl, over a pot of simmering water. Once melted, glossy and no lumps remain, stir in the butter and pour over the caramel layer, smoothing and spreading if needed. Sprinkle bars with a pinch of kosher or sea salt, as much or as little as you like. Chill completely, until set, then score and cut into small squares with a sharp knife. Wow. I think my heart just stopped with utter excitement. does this shortbread stand alone confidently? or does it get all shy and nervous and crack under the there's-no-one-to-carry-me pressure? OK, made these to bring to a friend’s house this past weekend, and they are fab-u-lous. I used Valrhona bittersweet chocolate on top and it was close to too much but not quite – that little pinch of salt sprinkled on the hot chocolate layer as it cools really did the trick. I’d like to try it with milk chocolate for sure. However, I think you left something out of the instructions – how exactly do I get these to pay MY bills? Because I still owe Con Edison a little something for all that heat they were nice enough to provide last winter, and that would certainly help. Hey - can I post your recipe on my blog? I tried it out this weekend and want to post my results. Delish, BTW! Thanks, dudes! I'm glad you've enjoyed both the blog and the recipe, Meredith! I am drooling, seriously. Yum! 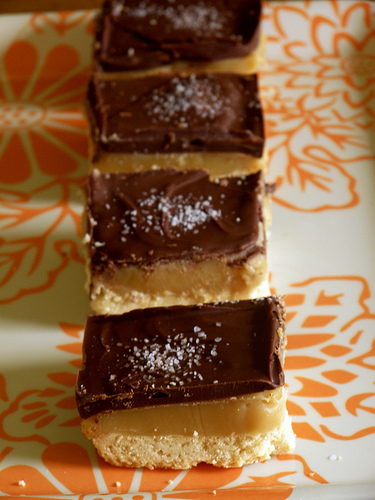 I just found your blog last week and saw this recipe, which I made over the weekend...salt lick bars are my new favorite thing! Mmm, these look great. I'll be coming back again for sure. Love your blog.